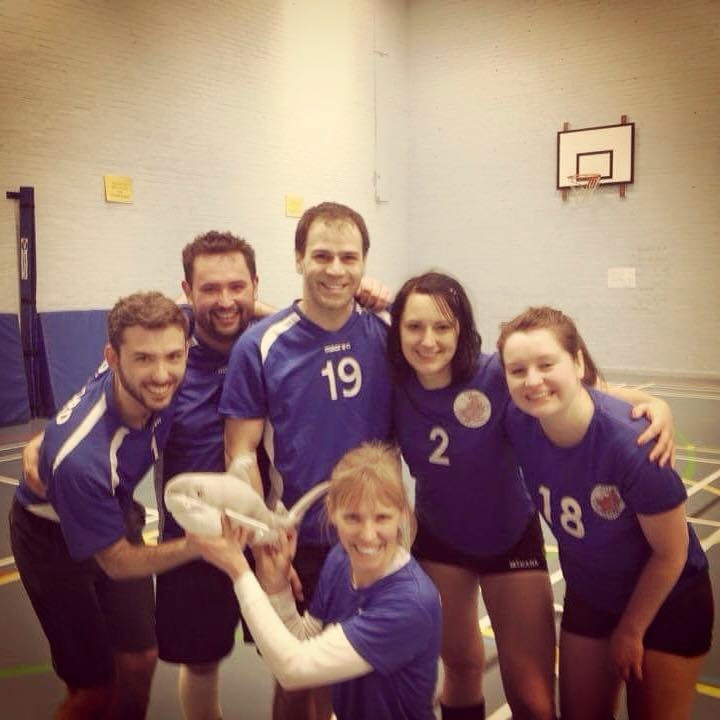 Oxford Volleyball Club: Oxford Sharks managed to swim through stormy seas! Oxford Sharks managed to swim through stormy seas! Last Sunday the Oxford Sharks headed to Reading with Felipe as setter, Tomas and Stefano as middles, Karina as coach/captain/opposite, Izzy and Asia as outsides and our mascot, Headington, as supporter. Two very tough and very long matches against stubborn competitors. Both matches were point to point and went to the tie breaks where Oxford Sharks managed to find the last energies and outdo the opponents. We fought very hard (1st set 31 minutes) for this victory against a strong Maidenhead team. (29:31; 26:24; 15:10). Thanks to excellent team work with outstanding individual performances we had the better end of a very close match. Again we played 3 sets to victory over another opponent with some strong hitters and good organization in the field (23:25; 25:18; 15:12). - Asia (our special guest for the day, thanks), digging an almost vertical hit within the 3 m line from one of the most terrifying hitters, right onto Felipe’s head. - Tomas finding his service again and scoring 10 points in a row contributing big time to unsettling the opponent and turning the match around while we were down 1 set and 6 points in the second set against Spikeos. - Felipe going after a tip over the block with one of his many great dives just to realise in time it was going out and then avoiding touch with most skillful acrobatics. - Izzy got MVP for both matches not only for playing great volleyball in attacking and cover but equally important great team motivation and keeping our communication going. - Stefano, scoring the last point of the day blocking a very strong hit from Spikeos’ middle. A liberation for everyone. - Karina, great volleyball, wise coaching and strong referee exhorting. - Headington, the sharkiest shark in Oxfordshire who is always with us to raise our spirits. Only two matches left. One is a special one. See you in two weeks!!! !